To be pregnant and give birth to a child is usually a life-changing event. Many couples wish to confirm the pregnancy by having a scan and getting the necessary pregnancy tests done by a doctor or midwife. You can have your first pregnancy scan, called the viability or dating scan, done privately when you are 6 to 11 weeks pregnant. The dates are calculated from the first day of your last menstrual period, not the day of conception. Many other tests/scans undertaken during pregnancy take place at a certain gestational age and knowing this accurately ensures that you do not miss the recommended timeframe. It is also important to know your due date accurately to avoid an unnecessary induction. The dating scan can show the gestation sac (indicating a healthy pregnancy) and the embryo. The fetal heartbeat is normally visible from 6 weeks onwards. It is usually done vaginally to allow a clearer picture of the baby. This is neither painful nor uncomfortable and is the best way to obtain clear images in early pregnancy. Performing an early pregnancy scan this way is not harmful to you or your baby, nor will it increase your chances of having a miscarriage. think you may be miscarrying. 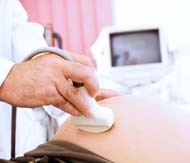 At Richmond Practice our female consultant obstetricians and gynaecologists are also specialists in fetal maternal medicine and ultrasound. They offer early pregnancy scans or viability scans privately and undertake dating and all other scans and tests recommended in pregnancy as part of the comprehensive maternity packages available from the practice. We will give you a copy of the "photo" of baby as a print-out and/or on a USB stick.